the ABC "jook sing" accents are hysterical. Line 1 from left to right: As I often heard children say " yeye " and "nene" for grandfather and grandmother, I guess that it's "ye" and "ne"
Line 2 from left to right : ? ; ? ; the 2 following have the character " gu " (the same as in guniang, young lady), if I'm not mistaken ; baba ; mama ; ? the second character is "po", if I'm not mistaken, but I don't know what it means (as well as "gu"); ? ; gu gu ; gu fu ? Line 4 from left to right : "er"? I wonder if it would be " di " instead of "er" ; sometimes,in movies, when a guy talks to his 2nd brother for instance,he says "er di". But it also seems to me that when heroes meet, they call each other xiong di, so, I'm a little bit confused... ; ? ; die ; die fu ? if it's "fu" as in "zhang fu" the husband, then, I must be mistaken regarding the last male of the line 2...; "zi", the "main" son ; is it the elder one ? ; taitai or something with "tian" (the son's wife); ? ; something with "mei" ; "meifu"
Line 5 from left to right : ? ; ? ; ? ; ? ; ? ;"ze" ; "nü" ; ? ; ? ; ? ; ? ; ? Line 6 : "er ze " and " er nü " ? Pfuiii ! Not easy !! The rest later !! reinafu it's not a test! i'm just showing family trees so you can have the characters for those relations! but thank you for trying to decipher the characters and relationships! i just put a single character for "ye-ye" and "nai-nai" (grandparents)--the character is doubled when you call them, that's all. so, each line is one generation starting with grandparents at the top and down to grandchildren at the bottom (with the exception of the cousins--if i put them on the same line as oneself and one's siblings, the chart would have to be that much wider!). spouses are joined by the horizontal line; the rest are blood relatives. the ones on the left are older siblings, younger on right (and the chinese do distinguish between them). It was fun to try to find the right terms. Is it possible that you write the pinyin for the different names in the families, please ? i think "nene" is a regional accent for pronouncing grandmother. the more proper way of saying it is "nainai". but i could be wrong--not a native mandarin speaker. ok, reinafu, pinyin done--and with intonation. 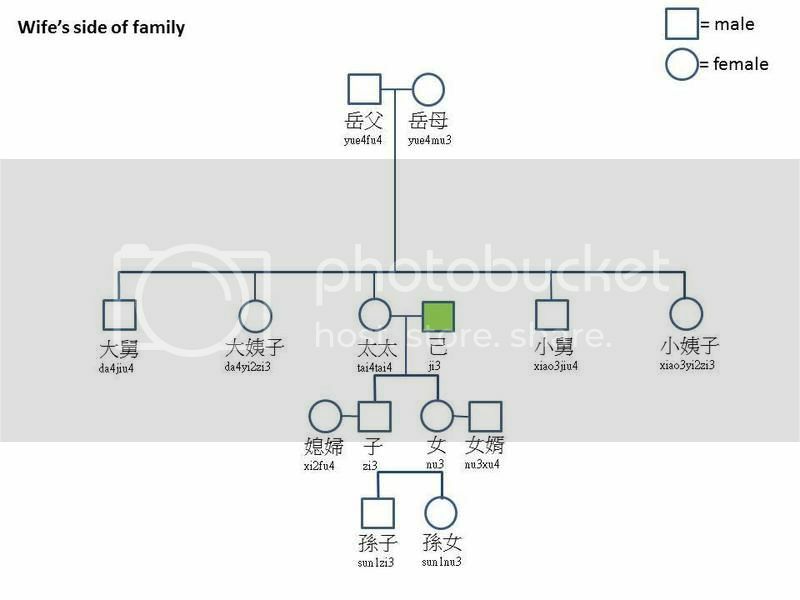 biaoge and biaomei are indeed one's cousins, but specifically the cousins who are children of your paternal aunts, maternal aunts, and maternal uncles. and i've added a link to the family post in the charts post for easy access. there are a few more characters/relationships in that post that aren't covered in the charts. in the case of palace eunuchs, "gong gong" is a courtesy title, much like "your majesty", "your eminence", "sir". In China, there are more complicated titles for family members and relatives than in English-speaking countries. 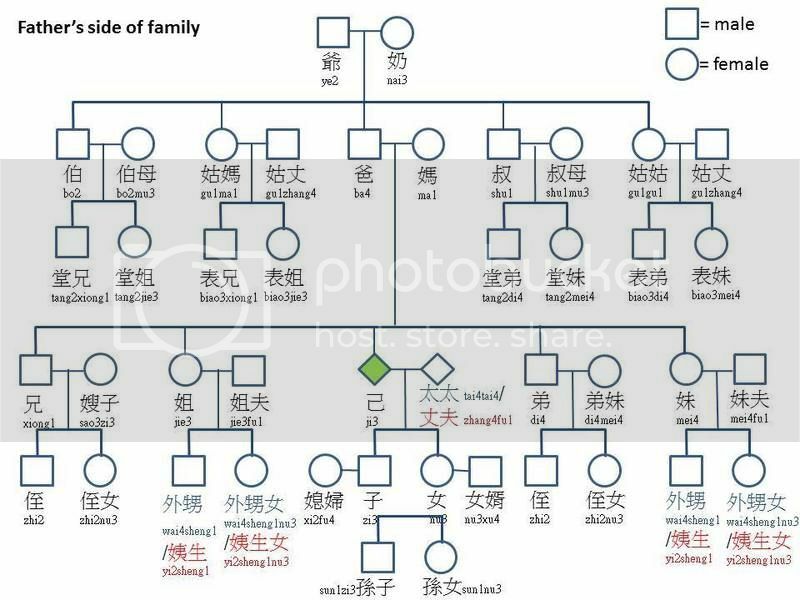 In this article, you are going to learn what to call your family members or relatives in Chinese! You may only use a few of these on a daily basis, but this is a comprehensive list of the titles you may come across while learning Chinese. 爸爸（bà ba）: dad; 父亲（fù qin）is the formal way to say 爸爸（bà ba）. 妈妈（mā ma）: mum; 母亲（mǔ qīn）is the formal way to say 妈妈（mā ma）. 爷爷（yé ye）: the dad of your dad (your paternal grandfather); 祖父 （zǔ fù）is the formal way to say 爷爷（yé ye). 奶奶 （nǎi nai）: the mum of your dad (your maternal grandmother); 祖母（zǔ mǔ）is the formal way to say 奶奶（nǎi nai). 姥爷 （lǎo ye）: the mum of your dad (your paternal grandmother); 外祖父（wài zǔ fù）is the formal way to say 姥爷（lǎo ye）. 姥姥 （lǎo lao）: the mum of your mum (your maternal grandmother); 外祖母（wài zǔ mǔ）is the formal way to say 姥姥（lǎo lao）. 大奶奶（dà nǎi nai）：the wife of the oldest brother of your paternal grandfather dad’s. If he is the second oldest, he is called 二爷 （èr yé）, and his wife is called 二奶奶（èr nǎi nai）, and so forth. @galvatron nice list! not quite complete, and i question a couple of the characters... but a nice supplement nonetheless! 奶奶 （nǎi nai）: the mum of your dad (your paternal grandmother); 祖母（zǔ mǔ）is the formal way to say 奶奶（nǎi nai). 姥爷 （lǎo ye）: the dad of your mum (your maternal grandfather); 外祖父（wài zǔ fù）is the formal way to say 姥爷（lǎo ye）. i really feel 姥爷 is either an error or a region-specific term. the usual term for maternal grandfather is wai gong 外公 or gong gong 公公. again, i feel this is a region-specific term. it's usually wai po 外婆 or po po 婆婆. i would argue that all the above are courtesy titles rather than how "you" would address these relatives, but i'm happy to be told i'm mistaken by someone in the know. likewise, i query the validity of these as well. i question whether 妗子 is the right term--feel it's also a region-specific term. again, i'm not claiming expertise, but i feel that this list (besides having some really funny translational errors) is a bit misleading in some cases. ok, i've asked around to my mandarin-speaking elders, and they said that 姥爷（lǎo ye）and 姥姥 (lǎo lao）are terms specific to beijing. the rest of the country go by 外公 (wai gong)/公公 (gong gong) and 外婆 (wai po)/婆婆 (po po). i didn't get a chance to ask about the other terms for the extended family, so if someone can confirm those, that'd be great! also, those specific terms on the list for the brothers- and sisters-in-law on your spouse's side of the family are also region-specific. generally, you call these in-laws by whatever term your spouse uses--or else you call them by whatever term your kids should use. in formal writing, there are some terms to refer to the brothers- and sisters-in-law but those aren't used in everyday speech. i've avoided using the formal terms for relatives because when you speak to people about their family members, you want to use terms they're familiar with and won't make you sound like some snotty foreigner who only learned words from reading a book. another general rule to keep in mind (that'll make things slightly easier) when trying to figure out what to call (especially) a member of the extended family who is either of the same generation or a higher generation than your parents: think about how that person is related to your dad or your mom, and call them by the right term and add the one-general-up term in front. 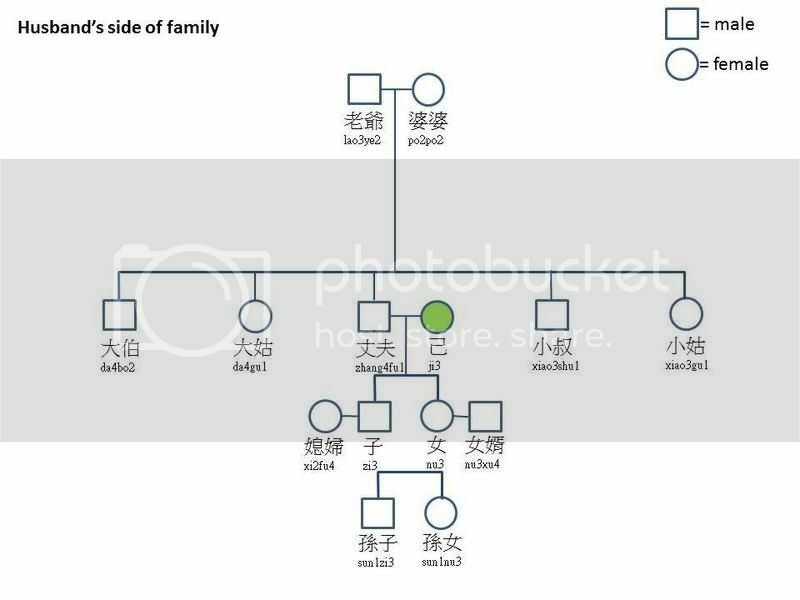 for example, your dad's father's brother's son is his 1st cousin, making him your "uncle-1st cousin" (that's not the right term, i know, but it gives an idea of how to go about figuring stuff out), and therefore, he is your 堂伯 (tang bai) or 堂叔 (tang shu), depending on whether he's older or younger than your dad. one of the "problems" with having specific but limited terms for family members is that, once you're outside the second-degree circle of relations, things start getting muddled and overlapping and confusing. when you get to, especially, the grandparents' generation of relatives, they are called the same term on your dad's side as your mom's side because, again, you use your parents as the reference point. so, your dad's father's sister is called the same term as your mom's father's sister. you'd need to specify "on my dad's/mom's side" in order to be clear about who you're talking about. 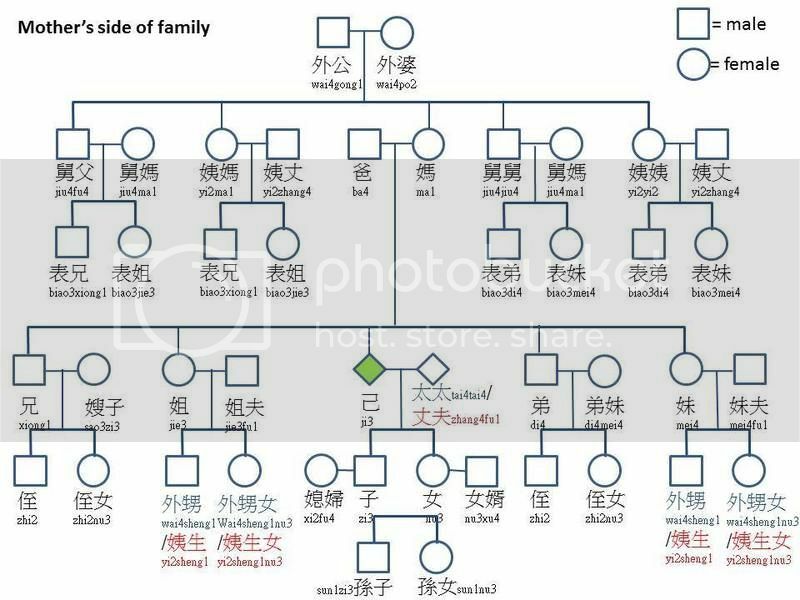 i'm purposely avoiding adding the chinese terms here because i only know the canto terms for these relatives, and i'm sure, without even asking those in the know, that it'll be different in mandarin. not going to confuse you!